Distributed resource plays whether shale, tight oil, or other variants considered unconventionals, continue to prove challenging in terms of predictability. Though present over large areas, optimization of well location and completion and stimulation designs remain critical to successful exploitation. Reservoir characterization, encompassing rock properties, petrophysical, geological, geochemical, geomechanical, measurements, maturity and other estimates, is evolving as historical data allows integration with drilling and completions experience, deliverability, and estimates of recoverable resources (EUR). The goals for seismic characterization of resource plays include the determination of lateral variations of elastic and petrophysical properties within rock units. The understanding of how these relate to well performance leads to quantitative reservoir characterization and the application of these data to support predictive analysis. These seismic-derived proxies for rock and elastic properties can be visualized and co-rendered in 3D space and readily integrated with other subsurface data. Any shale resource characterization exercise beings with a discussion on requirements for the different available data types that would be employed in the workflow, including seismic, rock properties, petrophysical, geological, geochemical, geomechanical, measurements, maturity and other estimates. With an understanding of the regional geology of the area, well-log correlation with seismic data is carried out, and defining the lithounits above and below the zone of interest, the phase of the seismic data is determined using synthetics derived at different well locations. 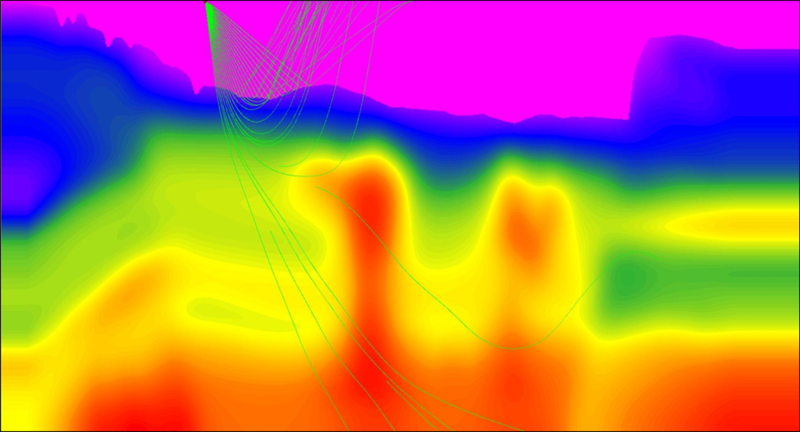 The available well-log and petrophysical data are analyzed next from a rock physics perspective. Correlation of W-2 well log curves with seismic data. 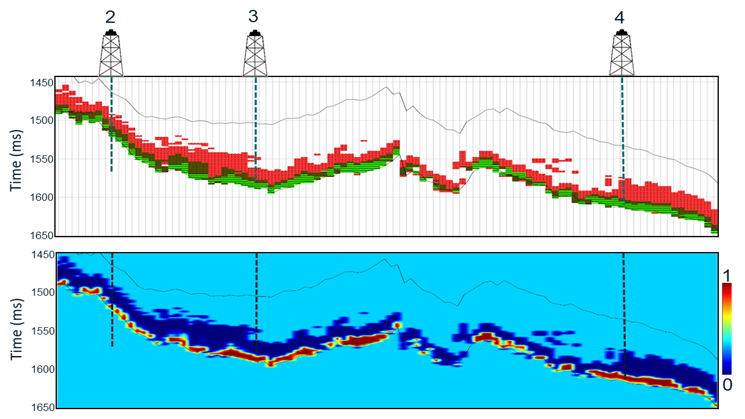 Blue traces represent the synthetics (generated with the wavelet shown above) while the red traces represent the seismic data. The correlation coefficient between the synthetic and red traces in the time window indicated by the yellow bars is 0.82, suggesting an overall good correlation. For a shale resource play to be successful, an optimum combination of depth, maturation, organic content, thickness, mineralogy, permeability, pore-pressure and gas-in-place needs to work out favorably. 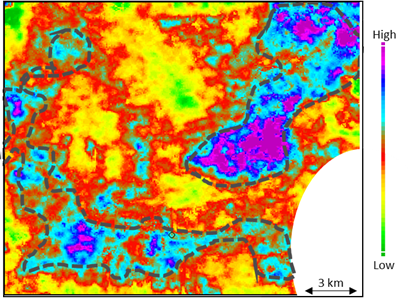 Most of the above key elements may be determined easily at the location of the wells, but the challenge is to determine them from seismic data to understand their spatial variation. Crossplot between E-rho and Poisson’s ratio for well W-1 broadly covering the Duvernay interval. The cluster of points enclosed by the red polygon appears to be anomalous and its back projection to the well log curves shows that it highlights the Duvernay zone. Crossplot of E-rho versus Poisson’s ratio attributes derived from P- and S-impedance values derived using prestack joint inversion, for data selected along line passing through well W-1. The cluster of points enclosed by the red polygon on back projection to the vertical seismic highlights the Duvernay interval that should be brittle. Effective propagation of complex fractures in the formations of interest is dependent on the rock’s ability to fail in a brittle manner. Consequently, various methods for determination of brittleness have evolved. One such method uses elastic parameters. A combination of Young’s modulus (measure of stiffness) and Poisson’s ratio (measure of strength) has been used to derive a measure of brittleness. Assuming higher stiffness and lesser strength would be required for brittle rocks, those pockets that exhibit high Young’s modulus and low Poisson’s ratio are interpreted as brittle and represent sweet spots. Usually, determination of density from seismic data is difficult due to the requirement of large offsets or angles. With this in mind, a new attribute E-rho (product of Young’s modulus and density) was developed at TGS, which eliminates the requirement of long offsets. As both Young’s modulus and density are expected to be high for a brittle rock, E-rho should also exhibit a high value for such a rock. 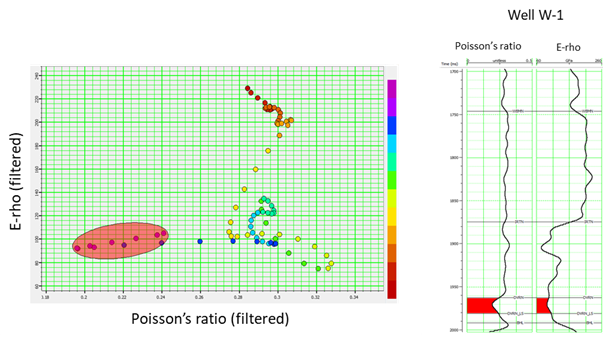 Crossplots of E-rho and Poisson’s ratio are first plotted from well log data for the zone of interest, and a cluster of points corresponding to high E-rho and low Poisson’s ratio are marked off. 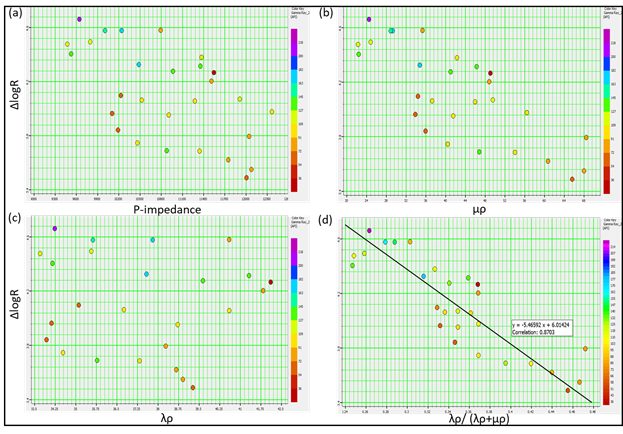 Equivalent crossplots for the same attributes derived from seismic impedance inversion are compared with the one plotted for well log data. They should exhibit similar shapes of clusters. Back-projection of marked off clusters on the crossplots on vertical seismic exhibit the zones that are called brittle sweet spots. At TGS, various projects have been carried out that span most of the prominent shale formations in North America and Argentina. If the crossplots of Young’s modulus and Poisson’s ratio or E-rho and Poisson’s ratio for different shale formations are examined, it is observed that brittleness does not always correspond to a high Young’s modulus and low Poisson’s ratio combination. This could be due to the different mineralogical compositions of the different shale rock formations. Interpretation based on such observations could be misleading. In addition, analysis and comparison of such well log crossplot clusters corresponding to different lithounits in terms of their stress-strain curves also shows that a straightforward combination of high Young’s modulus and low Poisson’s ratio is indeed not accurate. It is no wonder then that engineers and geomechanics experts cringe at the mention of ‘brittleness’. A more meaningful way out of such a confusing scenario is to describe shale zones in terms of their resistance to fracture growth. Such a measure of rock resistance to fracture growth is referred to as fracture toughness. A rock with low fracture toughness would promote fracture propagation. Horizon slice from a volume of inverse fracture toughness measure from the Duvernay formation in the Fox Creek area in central Alberta, Canada. 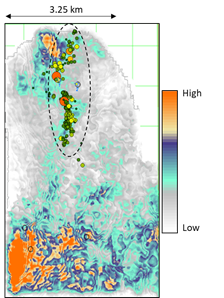 Notice the high values of inverse fracture toughness measure or low values of fracture toughness measure correlate well with the induced seismicity data overlaid on the display. Induced seismicity data is courtesy of Repsol Oil and Gas, Canada. Once the desired attribute has been obtained after use of the appropriate transform, it can be visualized for capturing the sweet spots. Such an exercise includes determination of sweet spots corresponding to organic richness. Crossplots of ΔlogR with (a) P-impedance, (b) μρ, (c) λρ, (d) λ/λ+2μ. A large scatter of data points is seen on three of the crossplots, except the one in (d), where we notice a linear relationship with a correlation coefficient of 88%. This relationship is then used to compute the ΔlogR volume. 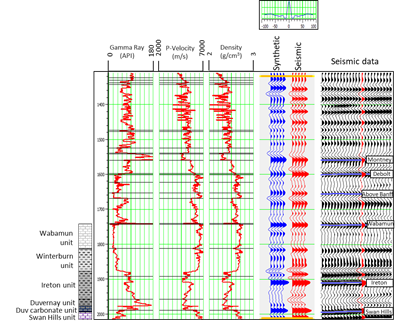 In the display below, crossplots of ΔlogR are shown with different attributes, and the pair of attributes that shows the best correlation is used to derive ΔlogR from seismic data. Horizon slice from the ΔlogR volume 10 ms interval below the Duvernay top marker. High values of ΔlogR are interpreted as being organically rich as seen in the cooler colors. 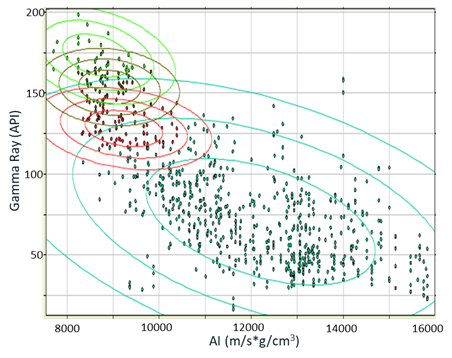 Usually, when pairs of attributes derived from well log data are evaluated in crossplot space, a clear differentiation for the quality of shale may not be possible, as cluster points overlap. As a result, the different models of the reservoir that we may deduce from the seismic data may have the same seismic response. It is possible to determine uncertainties associated with such reservoir characterization. In one such example, a Bayesian classification approach provided a facies model that reflects the quality of shale, and a probabilistic outcome as well, as the following examples illustrate. Crossplot between AI and Gamma Ray attributes for the Vaca Muerta shale in Neuquén Basin in Argentina. Probability density functions for three facies in light green, dark green and red are generated for the cluster points exhibiting low values of AI and higher values of Gamma Ray. These pdfs are then used for generation of facies in the Vaca Muerta shale. (a) The TOC values obtained from measurements on core samples over the zone of interest are shown in the form of a curve (red). This was a blind well test. Overlaid on this curve is the ΔlogR curve (blue) obtained by inversion of the seismic data. 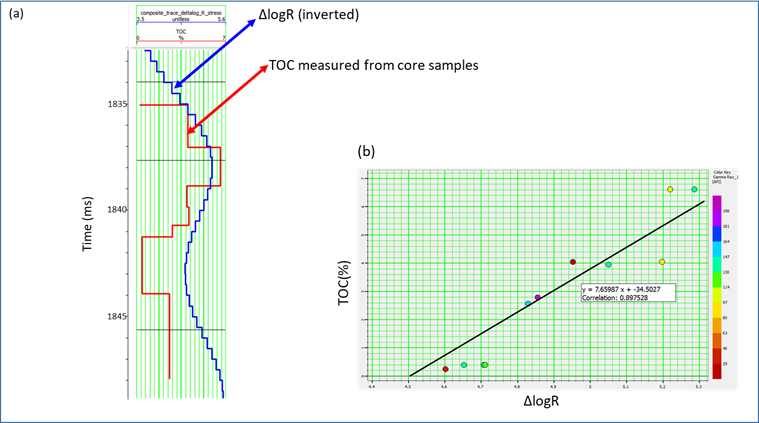 The match is seen as good as the increasing and decreasing trends follow each other reasonably well; (b) a crossplot between TOC and ΔlogR shows a correlation of 90%, which again lends confidence to the analysis. Fatti, J. L., P. J. Vail, G. C. Smith, P. J. Strauss, and P. R. Levitt, 1994, Detection of gas in sandstone reservoirs using AVO analysis: A 3-D seismic case history using the geostack technique: : Geophysics, 59, 1362–1376. Goodway, B., T. Chen, and J. Downton, 1997, Improved AVO fluid detection and lithology discrimination using Lame petrophysical parameters; 'λρ, 'μρ', & 'λ/μ’ fluid stack' from P and S inversions: 67th Annual International Meeting, SEG, Expanded Abstracts, 183-186. Goodway, B., 2001, AVO and Lame' constants for rock parameterization and fluid detection: Recorder, 26, no. 6, 39–60.